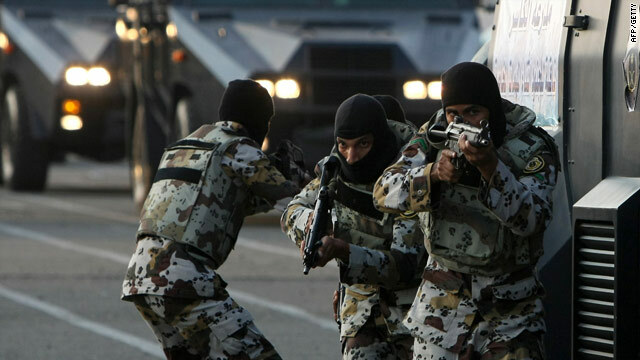 Saudi security forces -- like the ones seen in this file picture -- have arrested 149 suspected al Qaeda militants. Dubai, United Arab Emirates (CNN) -- Security forces in Saudi Arabia have arrested 149 people alleged to be members of al Qaeda, the Saudi Interior Ministry said Friday. Gen. Mansour al-Turki, Interior Ministry spokesman, said the people were plotting to kill government officials, security forces, and media employees. "Their general motives are spreading an ideology of hate by calling others disbelievers, collecting money to finance the deviant al Qaeda group inside and outside the kingdom, easing travel for some individuals for training in destabilized places and executing criminal plots to spread chaos and insecurity." al-Turki said. The arrests occurred over an eight-month period, and the people seized were dispersed among 19 active terrorist cells throughout the kingdom. Security forces found 2.24 million riyals (or about $600,000) among the cells. Saudi state-run TV reports said of the 149 people, 124 were Saudi nationals. There were also Yemenis and Egyptians. The cells have external links, al-Turki said, a reference to al Qaeda in Yemen, Somalia and Afghanistan. The people were involved in collecting money and financing terrorism, targeting oil refineries and government buildings, weapons training, and making hand grenades. Al-Turki said the suspects were trying to using the hajj, or Muslim pilgrimage, season to create unrest and pursue recruiting. The suspects pursued internet recruiting, and used nicknames in their recruiting efforts. Some of the names included God's beloved, the killer, the immigrant lion, the newcomer, and the daughter of beloved Najid. Among those arrested was a woman, who was sent back to her family after she was seized.